Occasionally you come across one of those homes - the one that has you slowly stating to yourself 'isn't this just beautiful' over and over, upon every new glance. Andrew Foster from Drewaire Constructions builds those very homes. 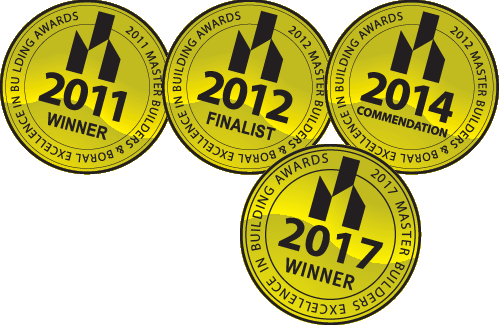 Mr Foster's recently completed custom design home in Hackett took out the award for Best Custom Built Home 2011 in his category and a finalist for Home of the Year - 2011 at the 2011 Master Builders & Boral Excellence in Building Awards. Homes magazine described his style as ''A good blend of harmonising materials such as corrugated iron and Australian hardwood. "The home has an almost country Australiana feel whilst still maintaining a modern edge." "Drewaire Constructions have exhibited meticulous workmanship and attention to detail in creating this beautiful and innovative home." ''We always put our heart and soul into every project, it's in my blood and I love the results we produce" Mr foster said. Of the award-winning home in Hackett, client Lindy described Mr foster as "a true craftsman, taking extreme pride in his work and always attentive to quality and detail." "He commands and achieves similar standards from his team and contractors alike", she said. "We already knew we had an absolutely stunning home, after all, we wake up to it every day. The award just made it public. Andrew was quick to visualise out plans. He Listened attentively to what we wanted and developed our ideas into practical and realistic solutions that were achievable within our budget. He was extremely patient in stepping us through each stage of construction and managing our expectations." Julie and Garry are other thrilled residents of a Drewaire home. "We live in a house that Andrew Foster built and it is perfect," they said. "Andrew's attention to detail, his understanding of pleasing design and his willingness to talk through ideas and options, has meant that we now live in the home we really wanted." With more than 21 years of building experience, the team at Drewaire Constructions know that your home should reflect your style and continue to look fantastic long into the future. Andrew and his team work hard to achieve a building experience that will have you feeling confident from start to finish.